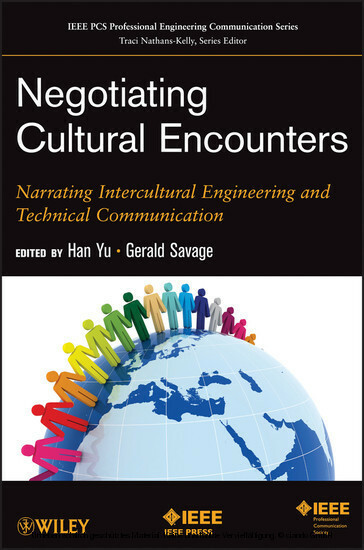 A book unlike any other in its field, Negotiating Cultural Encounters is ideal for all engineering and technical communication professionals seeking to better communicate their ideas and thoughts in the multicultural workplaces of the world. HAN YU is an Associate Professor of Technical Writing and Professional Communication in the English Department at Kansas State University. Dr. Yu has published numerous journal articles within this area. GERALD SAVAGE is Professor Emeritus and former Internship Director and Technical Writing Program Director in the English Department at Illinois State University. Dr. Savage has published numerous books and articles on technical communication. Jennifer O'Neill is a senior technical writer based in Brussels, Belgium. She has worked with technical publications for 17 years. O'Neill has a Master's degree in science in ergonomics and a background in usability. Prior to working with technical publications, she worked as an ergonomist in the United Kingdom and France evaluating the usability of buildings. It was during that work that O'Neill first became involved with building security and encountered the documentation that accompanies security products. O'Neill currently works for a U.S. multinational corporation that manufactures security products, such as closed-circuit televisions, for a global market. Canadian-born Irish, she speaks English as her mother tongue and is fluent in French. She has worked in three countries: the United Kingdom, France, and Belgium. Based on the writer's personal experience, this is a story about change, change that occurred against the backdrop of the global economy, change that rose out of the need for companies to stay fiercely competitive in the global market. As European and American companies went through mergers and acquisitions, publication units were relocated and restructured, and style guides had to be created, re-created, merged, and only to be abandoned. This story illustrates how a group of European technical communicators try to adapt to these changes and produce quality documentation for the global market. However, as various moves and false moves were made, the demands of some regions and markets rose to the top, while the needs and concerns of others fell by the wayside. Debates and discontent broke out, and compromises as well as one-sided decisions were made. Through it all, we learn the challenges faced by European writers trying to produce, on tight budgets, documents for a regional market that operates in 20 languages. We understand their frustration trying to educate American writers and editors on how to write for translation and localization. And, probably most importantly, we are asked to accept the necessity and reality of change. In January 2007, three heating and ventilation manufacturing companies, two located in the United States and one in Europe, merged to create a global company. Their joint product base now included heating, ventilation and air conditioning (HVAC) units, boilers, pumps, fans, filters, refrigeration, solar panels as well as more software driven services such as energy management and building automation systems. The merger made sense as all three companies wanted to expand their global reach in an increasingly competitive marketplace. It would help jump-start long-term growth because each company brought business, technology, and market strengths to the table that complemented each other. The two U.S. companies mainly operated in the North American market, although one had started to expand into Latin America and had small but growing sales offices in Mexico and Brazil. The European company operated across Europe, the Middle East and Africa (EMEA). From now on, all three companies would be known as Shannon Global Facilities, Inc. (all company and character names used are pseudonyms). The two U.S. companies both had a technical publications department, located, respectively, at their R&D sites in California and Arizona. Collectively they had nine writers, one editor, and two documentation managers.